Wyatte is a Kentucky Mountain Saddle Horse gelding. He used to gait very well, but has learned to do a dead pace instead. Our first session was 2 months ago in September. In that training session, we worked for quite a while training him to softly give his nose. Mostly we were working on vertical flexion. He was used to going forward only at a fast speed and with his head up way too high. In our second session, we worked a lot at trying to get him to stretch down and helping him break up the pace he was so used to doing. As the training went on, it was becoming clearer that he had lots of tension in his neck and back and wasn’t able to release it. We then tried to help him do lots of stretching. It was only after we had done lots of forward stretching that he finally began to relax, lift his back, lift the base of his neck occasionally, and go forward with his head and neck low. If you can safely ride your horse, work on this right away. I do this first thing on all the horses Iride. 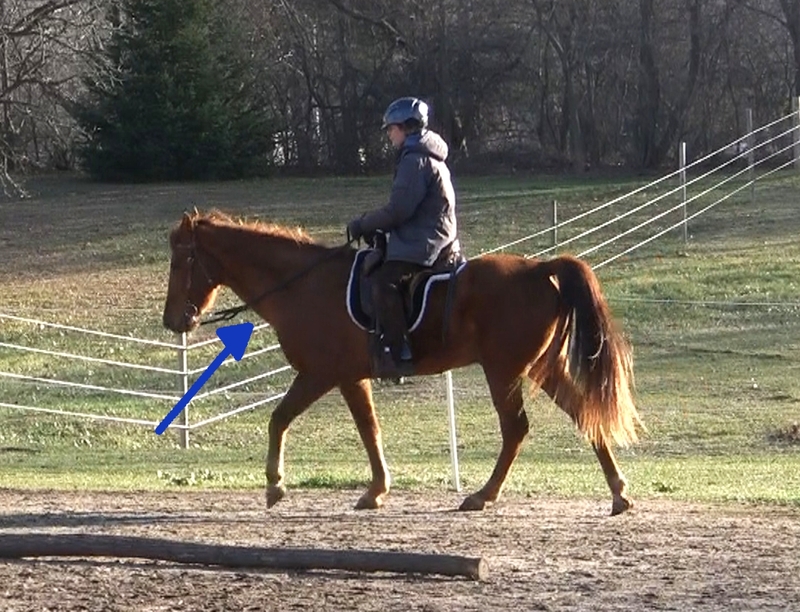 This is often easier for the horse to learn while moving forward and on a slight bend. Check out Mike Schaffer’s dvd “Right from the Start”. Check your hands and then check the bit. Are you pulling on him and making him put his head up in pain? Low doesn’t mean on the ground, but it might mean that he holds his head and neck level with his withers. Use ground poles to help him stretch down. Look at photos and live horses to learn what this looks like. The underside of the horse’s neck, especially where it meets the shoulder should look like the first photo and not the second photo. Use exercises like moving the shoulder over while walking to help encourage the base of the neck to lift. 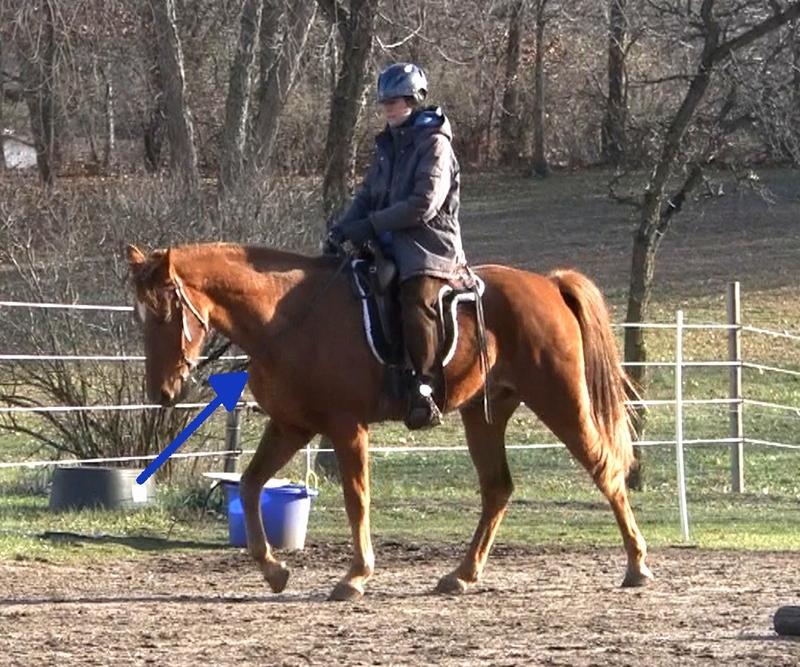 Make sure your horse is going FORWARD as you do this exercise. It doesn’t mean rushing, but he shouldn’t be pokey. If you would like to watch the full video and read the whole article, sign up for my Free Email list here! Love your work with Wyatte. Simplicity and patience of your work shows through with the horse and rider. Love your manner of teaching.